I was sitting, alone in the house last evening waiting to attend a house concert where I knew it would be toasty and warm. I was cold! It seemed cold in the house even though the temperature read 69 degrees. I had only a few hours before congratulated myself on a second straight month of sub $170 electric bills. Yay! My house is 100 percent electric, except for the wood burning fireplace which totally rocks on cool evenings. But, as I was departing in less than an hour, I really couldn't start a fire to leave unattended. Nor would I turn up the heat pumps to raise the temperature. 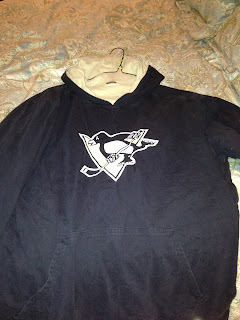 My Pittsburgh Penguin hoodie was looking pretty good at this point. So I went and got it from the closet. How is it possible that a frustrated beach bum like myself can like a sport played on ice? I laughed at the paradox as I slipped the hoodie on. And the warmth began. I even started to regain feeling in my fingers. I heard the heating system start up and saw the cat walk over to a register to enjoy the warm air being forced into the room. I think Makayla was jealous. The cat beat her to the register to soak up the warmth. Maybe I need an electric blanket for Christmas? Nah, just a one-way ticket to Key West.